After painting fun and girly pictures I decided to be explore the medium a wee bit more seriously. So what what else to paint than flower? 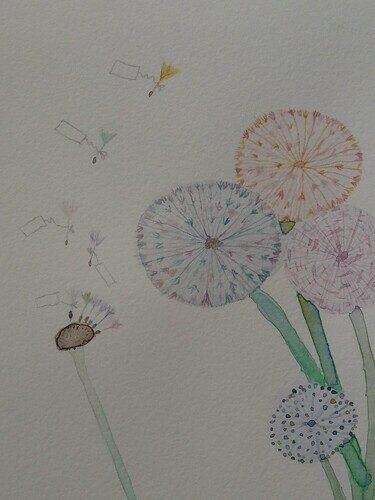 My first attempt was the dandelion, and i couldn't resist the tags, hence it came out a wee bit girly again- but through all my fun and trial pieces I have learnt something. I am quite happy with it- except I managed to make a smudge (again!). And serious watercolour is not quite as much fun as my earlier doodles- the sense of achievement (despite the lack of greatness) is huge though. I guess I will do a bit of both? 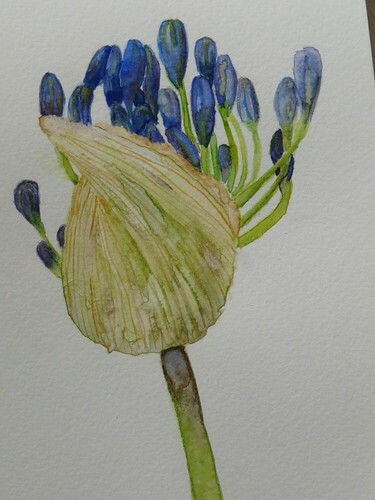 Due to my errors I stopped painting for a few days, sat down and thought about my watercolour experience. Don't hurry - let the paint dry when needed, you will see the end colour and won't smudge as a result! ps: the weekword this week is REINVENT, in case you would like to join it! i think your tips are perfect! watercolor is a frustrating medium for me and I tend to avoid it, but i'm inspired to pick up brushes after seeing your work! have fun, fun, fun! watercolors are really hard because you can't really hide your 'mistakes'! i think you're doing marvelously! Your watercolours are beautiful! I love watercolour for the fun it is-the way the colours mix and dry in strange swirls and splotches. My advice? Be patient!-only kidding-enjoy your future watercolours!